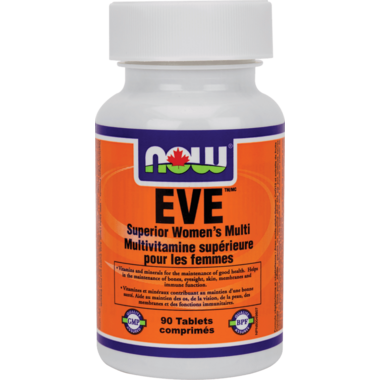 NOW Foods EVE Superior Women’s Multivitamin is uniquely positioned to maintain overall good health with optimum levels of major vitamins and minerals. It also contains Cranberry, Iron, Vitamin K1 and K2, high potency Vitamin D and Calcium balanced with Magnesium, Lycopene, Alpha Lipoic Acid, and CoQ10 to address women’s common health issues. The 2 tablet per day format provides higher dosages of key nutrients and better absorption versus one per day formats. Directions: Adult Dosage: Take 1 tablet twice daily with food, a few hours before or after taking other medications or health products. Non-Medicinal Ingredients: Cellulose, Tablet Coating (hypromellose, calcium carbonate, xylitol, spirulina, trehalose dehydrate, riboflavin, medium chain triglycerides), Silica, Stearic Acid (vegetable source), Ascorbyl Palmitate, Croscarmellose Sodium. TRAACS® is a registered trademark of Albion Laboratories, Inc. US Patent 7,838,042 and patents pending. FloraGLO® is a registered trademark of Kemin Industries. Caution: Do not use if you are pregnant or breastfeeding. Do not use if you have abnormal constrictions of the gastrointestinal tract, potential or existing intestinal blockage, atonic bowel, appendicitis, inflammatory colon disease (e.g. Crohn's disease or ulcerative colitis), abdominal pain of unknown origin, undiagnosed rectal bleeding, severe dehydration with depleted water or electrolytes, hemorrhoids or diarrhoea. Consult a health care practitioner prior to use if you are taking blood thinners or blood pressure medication, cardiac medications (e.g. cardiac glycosides or antiarrhythmic medications), thiazide diuretics, corticosteroids, licorice root or other medications or health products which may aggravate electrolyte imbalance. Consult a health care practitioner prior to use if you have a history of kidney stones or a kidney disorder, if you have diabetes or if you have faecal impaction or symptoms such as abdominal pain, nausea, vomiting or fever, or if symptoms persist or worsen. Hypersensitivity/allergy has been known to occur to acai or plants of the Arecaeae family; in such a case, discontinue use. Reduce dose or discontinue use if you experience abdominal pain, cramps, spasms and/or diarrhoea.